For preschoolers, play, experimentation, and social interaction are key to learning. Children need structure and limits in order to feel secure. We balance free play with daily routines, and group projects with individual creativity. Learning to work and play together, share, and take turns is an important part of developing social skills. Arrive at school around 9 am and play for about an hour, until the clean-up song cues the children to put away their toys. Circle Time follows, a favorite part of the day. A monthly theme is presented and discussed, which will then be explored through songs, books, art, and field trips. Snack time is for socializing and refueling, with shiny clean hands and faces. The weekly music/movement class is always a winner! Outdoor play, games, or walks get the children eager and ready to clean up and sit down for lunch. Children enjoy their healthy lunches, packed and sent to school by their parents. Dismissal is at 12:30 pm. Depending upon enrollment we offer a theme based afternoon program from 12:30 to 3:30pm. Cabin John/Brookmont Children’s Program was established by local parents in the early 1960s to give the children in the community a creative pre-school experience. Originally, the school started in Cabin John, MD, for families in which it was necessary for both parents to work. Parents, teachers, and the community, through the Cabin John Citizen’s Association, worked hard to provide an affordable, reliable, and positive alternative to baby-sitting. Since it moved in September 1988 to its current location in the neighborhood of Brookmont, the school has evolved into a positive educational and recreational program for three- and four-year-old children from the local community at large. Brookmont is a close-knit Bethesda neighborhood off MacArthur Boulevard, just over the DC – Maryland border. 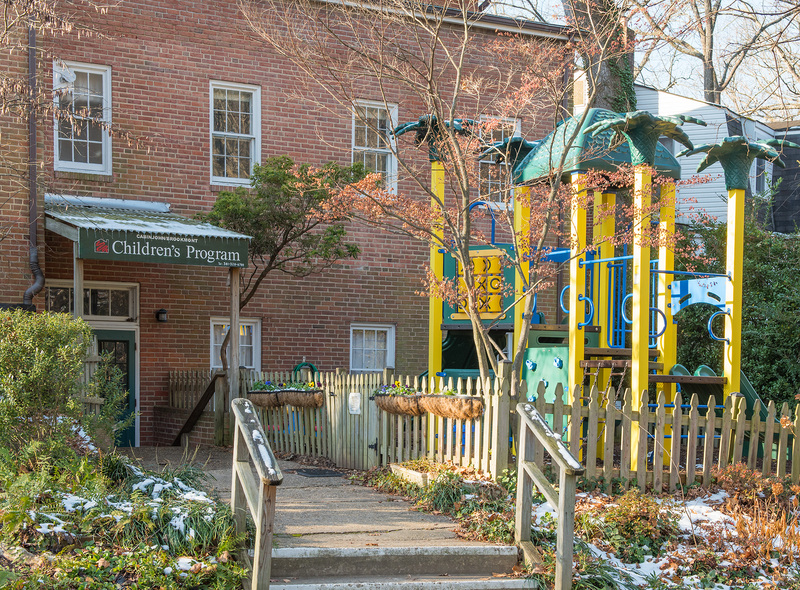 Located along the Potomac River and the C&O Canal, the school is less than a mile from the Shops at Sumner Place, just over a mile from Sibley Hospital, about 4 miles from downtown Bethesda, 6 miles from downtown Washington and 8 miles from Potomac. The school generally operates Monday through Friday from 9:00 a.m. to 12:30 pm. Cabin John/Brookmont Children’s Program follows the Montgomery County Public Schools calendar for school holidays and emergency closings. If MCPS announces a one or two-hour delayed opening, CJBCP will follow accordingly with a delayed opening. On MCPS scheduled early release days or emergency early dismissals, school will end as usual at 12:30 pm.